Prof. Dr. Sergey Zagraevsky. New researches of architectural monuments of Alexandrov Sloboda. Chapter 1. The questions of the date of architectural monuments of Alexandrov Sloboda of XVI c.
Chapter 1. The questions of the date of architectural monuments of Alexandrov Sloboda of XVI c.
The questions of the date of architectural monuments of Alexandrov Sloboda of XVI c.
Fig. 1. 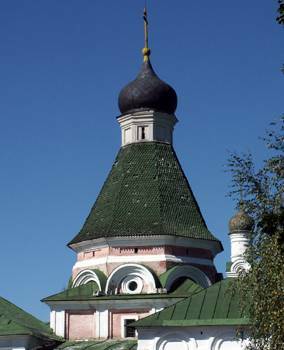 Pokrovsky (now Trinity) Cathedral. General view. Рис. 2. Троицкая (ныне Покровская) церковь. Общий вид. Fig. 3. Assumption Church. General view. Рис. 4. Распятская колокольня. Общий вид. In this form of Dating sites Sloboda XVI century existed until investigations Kavelmahera. In 1980-1990-ies he spent an unprecedented series of excavations and soundings, which revealed a fundamental fact: Pokrovsky Cathedral, Holy Trinity Church, assumption Church and the Church of Metropolitan Alexis (in the future will for simplicity to call them first temple of Alexander the settlement) were built in the same building period. In all these monuments Kavelmaher noted materials (brick and white stone) similar conditions, homogeneous binding identical connecting iron, machinery mixed masonry, United Italianate "graphical style of the Russian court of architecture of the XVI century, with the use of the same, clearly unified, units and components - shaped panels, sets of profiles of base, crowning rods and capitals6. Laying all the temples were originally open - did not dyed and not bleached, was tinted white gesso just some made of brick elements of decor. All speakers white stone elements were the same type of bonded brackets7. All churches (except for the pillars of the Church of Metropolitan Alexei) were built with aisles and adjacent chamber is%8. В интересах всего ансамбля ложный подклетный ярус и ложную паперть со звонницей получила и церковь Алексея митрополита9. Varied buildings among themselves only by the amount and quality of coverage of their "prazhskoe" thread, but Kavelmaher noted uniform style of this thread (except ornamental belts Pokrovsky Cathedral, copied from the Trinity Cathedral of the Trinity-Sergius Lavra - Fig. 5)10. Fig. 5. 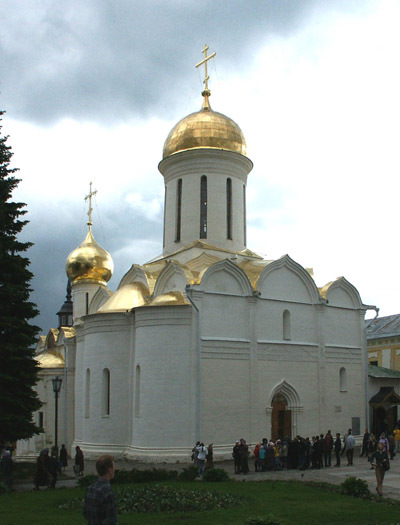 Trinity Cathedral in the Trinity-Sergius Lavra. This reasoning Kavelmahera was rightly perceived by the researchers as comprehensive11and inevitably the question arose about the correction of earlier dates. Kavelmaher, referring to already given us the text of the Trinity chronicle12 and the proximity of the stylistics of the first temple Alexander the settlement to the style of the Kremlin cathedrals of Ivan III and Vasily III13 (this stylistic affinity was noted Aiecraft14), dated the Church of the protection, Trinity, assumption and Alexei, Metropolitan of the first construction period Sloboda - the beginning 1510-ies. The second construction period - 1560-1570-s - Kavelmaher attributed only to the restructuring of the Church of Metropolitan Alexei and the extension to the Trinity Church refectory in the cellar and basement15 (these construction works could be mentioned "the Germans-the Oprichniki" Itauba, Accuse and Gstadt16). - "too much in the concept Kavelmahera (relative Dating of the first temples Sloboda 10-ies of the XVI century - SZ) contrary to established views on the development of architecture of the Moscow Russia of the XVI century"18. The first and second arguments SS Podyapolsky have General theoretical and cannot serve as a basis for any dates. According to Kavelmahera, "there is no dispute between the facts and theory (i.e. 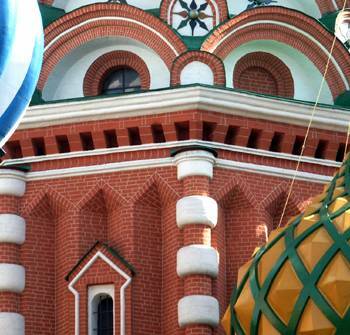 our current understanding of the Genesis of Russian tent-roofed architecture) and facts. In this situation, the duty of the researcher - unconditionally to stand on the side of facts"22. The third argument S. Podyapolsky negative: an indication of the invalidity of one of the evidence Dating 1510 ties cannot serve as a proof of Dating 1560 mi 1570 (moreover, in paragraph 2, we show that in the message of the Trinity chronicle still States it on the stone temple). The argument is essentially only the fourth - the first attempt to date the temples Sloboda on stylistic analogy with Moscow buildings of the middle-second half of the XVI century. However, in this study we will consider all aspects of the positions and Kavelmahera, and S. Podyapolsky. Consider first the question of what the Church is stone or wood - said in the quoted paragraph 1 message "Trinity chronicle. A.I. Nekrasov believed that the mere fact of the message of sanctification shows that the Pokrovsky Cathedral was made of stone23but rightly stated SS pod'yapol'skii24that "Holy Trinity chronicle reports not only of stone temples, but also a wooden Church. Adding that the Orthodox dogmatic point of view, which, of course, adhere to the authors of the Trinity chronicle, the consecration of wooden and stone churches are absolutely equivalent. However, we may use the message "Trinity chronicle for Dating the existing stone - Pokrovsky Cathedral 1510 ties. We will show this. To quote again this message, highlighting the italic words, you should pay special attention: Summer 7021 October 3 Sergius in the monastery of the founding Sergievo monastery gate kirpichnyi, and of St. in the name of Sergius chyudotvortsa. Summer 7022 November 28 Holy byst tsrkv drevena in Klementyev. Those years December 1 ssna byst tsrkv Cover STEI btsy in the New village Oleksandrovskom. Then f knz great and yard vshel. Those of MSCE December 15 ssna byst tsrkv kirpichnyi in Sergius monastery of St. sty Sergius..."
We see that in this message, we are talking about four buildings (the fortified gates of the Trinity-Sergius Lavra, the Church in the village Klementyev gate Church of St. Sergius of Radonezh in the monastery and Pokrovsky Cathedral in Alexandrov Sloboda). In three buildings of the construction material, and very accurately - the-brick building called it the brick, not generalized "stone"as it is usually done in the Chronicles. But on the most significant of these buildings - the intercession Cathedral on the Grand courtyard - the material does not say anything. This situation may seem strange, because just forget to make the necessary clarification to the building material princely temple scribe was unlikely. Thus, we must assume that the message "Trinity chronicle speaks of sanctification in 1513 is hard Pokrovsky Cathedral. In paras. 4 and 5 we can see that for Dating this temple (and the rest of the first temples Sloboda) the beginning of the XVI century there are other reasons, but for now let us turn to the main (and, in fact, the only) argument S. Podyapolsky in favor 1560-1570-s - stylistic features of the differences of the first temples Sloboda with the Kremlin cathedrals beginning of XVI century and their hypothetical similarities with the Cathedral of the Intercession on the Moat and the top of the side-chapels of the Cathedral of the Annunciation. In large part, their reasoning SS pod'yapol'skii referred to al Batalov (which, in turn, in recent years, refers to S. Podyapolsky25), so we will consider the position of the two researchers. First of all note that Italianate motives in the architectural decor of Russian churches have taken place throughout the XVI century (and it showed A. Batalov26). Consequently, the mere presence of such motives may not be grounds for any dates - as 1510 mi and 1560 mi 1570 years. A. Batalov%227. With marked differences between their features could not agree more. But whether there has been at the same place the similarity of these temples settlement with the churches in the middle-second half of the XVI century? The main object with which these researchers have tried to find a stylistic similarity of the first temples Sloboda, was the Cathedral of the Intercession on the Moat. And that in itself raises doubts about the loyalty of any drawing analogies, as in the architecture and decor of the Moscow Cathedral of the wizard originally sought to combine a variety of styles - "many different designs and translations"28. And yet we list all the features, which, according to al Batalov and S. Podyapolsky determine the similarity of the first temple quarter and the Cathedral of the Intercession on the Moat. Firstly, A. Batalov wrote29 (and confirmed S. pod'yapol'skii30)that "in the aisles of the Intercession of the virgin and of the Entry into Jerusalem Cathedral of the Intercession on the Moat, platbands all Windows the same way as in Alexandrov (Trinity Church, see Fig. 2 - SZ), contact with archivolt of kokoshniks. Fig. 6. The Cathedral of the intercession on the Moat. The Windows in the headdresses and decor of the Central pillars. Fig. 7. Entry into Jerusalem chapel of the Cathedral of the Intercession on the Moat. The Windows in the headdresses. Secondly, S. pod'yapol'skii believed that the replacement polukolonok infill track brings the Western portal of the Pokrovsky Cathedral of the Alexander settlement with the portals of the Central pillars of the Church of the Intercession on the Moat. However, the researcher was forced to make a reservation, that the Moscow Church, "the truth, the interior of the aperture surface of the hanger is decorated, and the bases on outside no31. 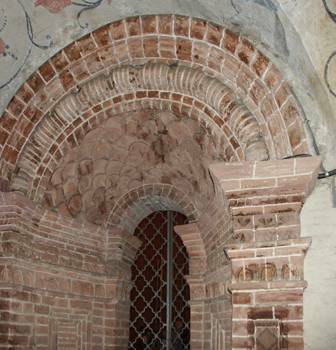 As a partial replacement polukolonok infill we see on the portals of the Archangel Cathedral (Fig. 10), and the Northern portal of the Annunciation Cathedral (Fig. 11), and on the portal of the Cathedral of the Chudov monastery (1501, Fig. 12). Fig. 8. The Western portal of the Cathedral of the Settlement. Fig. 9. Southern portal of the Central pillars of the Cathedral of the Intercession on the Moat. Fig. 10. The Northern portal and panels "basement" tier Cathedral in the Kremlin. Fig. 11. The Northern portal of the Annunciation Cathedral. 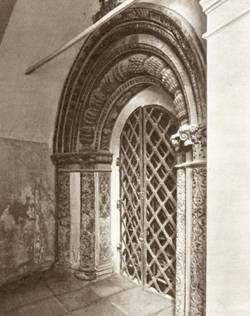 Thirdly, A. Batalov argued that the decoration of the portal Fedorovsky chapel of Trinity Church in the form of balusters (LSA, as "exaggerated Busin32) similar to the decor of the Northern portal of entry into Jerusalem chapel of the Cathedral of the Intercession on the Moat33. But, again, look at Fig. 12 and 13, to understand: these portals are absolutely different shape and beads, and bridges between them. Has nothing in common and form themselves portals (for example, on the portal of entry into Jerusalem chapel missing upper front), and the interpretation of all their parts. Рис. 13. Южный портал Входоиерусалимского придела собора Покрова на Рву. Note that the same portals, as from the entry into Jerusalem chapel, the side-chapels of the Trinity and of St. Nicholas Cathedral of the Intercession on the Moat, and on the facade of the Central pillars of the Cathedral there is another kind of "hypertrophied Busin (see Fig. 6). More fundamentally, what is "exaggerated beads" were already present on the portal of the Cathedral of the Chudov monastery (1501, Fig. 14). Fig. 14. The portal of the Cathedral of the Chudov monastery in Moscow (1501). Fourth, S. pod'yapol'skii said that narrow strip inclined laying in the basis of the tent of Trinity Church between two closely spaced cornices, cut in the middle of each edge small window, is "somewhat modified motive machicolation that are not found in the churches of Moscow before the middle of the XVI century (the Church of the Intercession on the Moat, the Church in Djakova)"34. Fig. 15. The box at the bottom of the tent of Trinity Church in the village. In addition analogy (as we have seen, unconvincing) with the Cathedral of the Intercession on the Moat, A. Batalov35 and SS pod'yapol'skii36 supposed resemblance of the figure of panels - the main motive of the galleries of the first temples Sloboda and upper chapels of the Cathedral of the Annunciation in the Moscow Kremlin. But in Fig. 16 and 17 that nothing panels churches and chapels Sloboda Annunciation Cathedral have not. They have completely different proportions, depth, Oblomov. Fig. 16. Decorated panels southern wall of the assumption Church in the village. Fig. 17. Southern upper chapel of the Annunciation Cathedral. And the panels, combined with a solid cornice, we see on the "ground" white-stone floor of the Cathedral's facade (see Fig. 10). 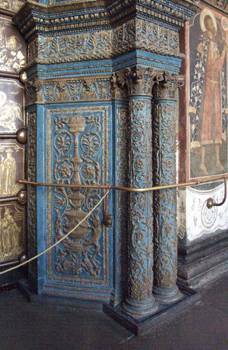 S. pod'yapol'skii also involved as an analogue of stylistic thread Western portal of the Cathedral of Alexandrov Sloboda the thread southern gallery of the Annunciation Cathedral39. 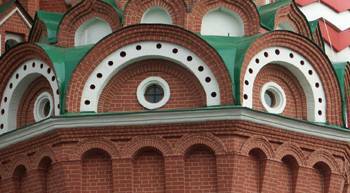 However, the researcher did not use it as a stylistic similarity as Dating back to the sign, as the thread southern gallery Kremlin Church has just installed the date40. But in recent years this thread dates back to Grozny time A. Batalov41 and AV grashchenkov42. Accordingly, these researchers use of stylistic similarity of this thread with thread Pokrovsky Cathedral as the basis for Dating the last 1560 mi 1570 years43. But even if we assume that the carved decoration of the southern gallery of the Annunciation Cathedral can be independently dated Grozny time, it still cannot serve as a basis for Dating the same time the thread Western portal and Kyoto Pokrovsky Cathedral. 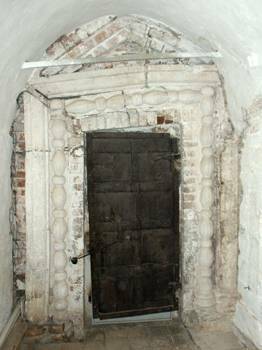 The fact that, as noted by S. pod'yapol'skii, thread the South gallery of the Church of the Annunciation is "a deliberate appeal to the samples"44 - gourmet "prazhskoe" carving the beginning of the XVI century portals Arkhangelsk (see Fig. 10) and the Annunciation (see Fig. 11) cathedrals. In other words, we see a purposeful styling made, as rightly believed and S. pod'yapol'skii, A. Batalov, and AV grashchenkov, other performers45. Accordingly, certain similarity carvings of the Cathedral of the Settlement with the thread southern galleries Annunciation Cathedral is absolutely clear rationale - shared origins and under no circumstances may not be invoked as a Dating distinction, as such stylization can occur in different places in the most different time - and in 5 or 50, and 100 years after the creation in the beginning of XVI century originals are shown in Fig. 10 and 11. To attract as Dating back to the characteristics of any of these stylized carved decor is equally inappropriate, as, for example, to date the Alexander Pokrovsky Cathedral 1420-ies on the basis of similarity of its ornamental belts with ornamental belts Trinity Cathedral of the Trinity-Sergius Lavra (1422-1423 years). Thus, we must note the lack of convincing stylistic arguments for the Dating of the first temple Alexander the settlement 1560 mi 1570 years. But given these researchers stylistic arguments are unlikely to be self-sufficient basis for the Dating of the first temples Sloboda 10-ies of the XVI century: too many features of the differences of these churches with the Kremlin cathedrals abroad XV-XVI centuries noted A. Batalov and S. pod'yapol'skii48. For Dating the first temple Alexander the settlement 1510 ties a number of other, far more persuasive (see paras. 2, 4 and 5). In this regard, we can make some General considerations. In respect of the first temples Sloboda any stylistic analysis (and Ahiakonou, and VV kavelmaheru, and Alinalove, and LSA) allows you to make only one indisputable conclusion: these buildings is absolutely unique, and the maximum accuracy of Dating based on stylistic analysis - XVI century. This situation is typical not only for the first temple Sloboda. To achieve the required accuracy of Dating of temples "on stylistic similarities" does not allow a fundamental and unavoidable factor: the artist's individuality. In connection with all mentioned in this section, you can draw a General conclusion: the formal and stylistic analysis, detached from the documentary, historical, architectural and archaeological data, can give more negative than positive results (for example, S. pod'yapol'skii even noted that "wrong, as painful as broken figure Western portal Pokrovsky Cathedral Sloboda has something relating it with plastic Nouveau"50). In any unique buildings (which is the vast majority of the monuments of old Russian architecture of the XII-XVI centuries) the personality of masters leads to the fact that all the similarities monuments highly conditional, and on each line similarities can be found incomparably greater number are much more fundamental features of the differences. Much higher accuracy can provide an analysis of the characteristics of construction machinery: brickwork, mortar, form and quality of brick, stone, etc. First, opportunities for the expression of individual masters in the construction industry was practically was not. Secondly, construction machinery is closely linked with the technology of manufacturing of materials (brick, stone, mud), and the latter is significantly easier to "fix" to this or that time. And available to the author visual-tactile analysis of construction equipment showed in the intercession Cathedral, Trinity, and churches of the assumption, the Church of Metropolitan Alexei we see a soft, warm stonework, typical brick buildings of the Moscow Kremlin of the turn of the XV and XVI centuries52 and St. Peter the Metropolitan of vysokopetrovsky monastery (1514-1517 years). Characteristic and mortar - with extremely high binding capacity, with a negligible content of lime sand and other impurities. Numerous white-stone ornaments and Settlement, and the Kremlin were carved so that seems like a stone "breathes". 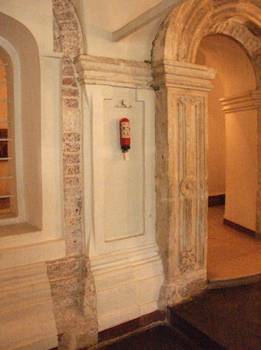 In the Cathedral of St. Peter the Metropolitan brick decor, as well as in the Settlement, was covered with gesso "a white stone. In contrast to the above buildings, Crucifixion tower built of "dry" (in the words of V. Kavelmahera, "fried"53 bricks, crumbling easily to a solution with a high admixture of sand. 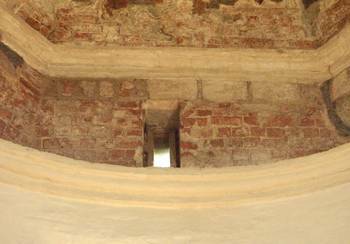 From the same brick in the same solution, built the Cathedral of the Intercession on the Moat. The white-stone decor Crucifixion bell also carved, as at the Cathedral of the Intercession on the Moat, - hard, geometric, "dry". And in the belfry Crucifixion, and in the Cathedral of the Intercession on the Moat, the builders used along with iron bonds of wood. In the Church of the protection, Trinity, assumption and Metropolitan Alexei Alexandrov Sloboda all connections made entirely of iron of high quality54. It is important to mention the fact that he was compelled to recognize and A. Batalov55: if date first temple Sloboda 60-70-ies of the XVI century, these monuments will be the only applied where the white-stone decor "in the measure in which it was used in the construction of Vasily III". Of course, masonry and other features of construction equipment still can't give absolute confidence in Dating "by analogy", as construction technology, depending on local conditions (quality clay, stone and lime, professionalism of local craftsmen) could vary significantly. But since, as we showed above, the opportunities for the expression of individual artists in the construction industry was virtually no such data if available, provide a more accurate results than the formal and stylistic analysis. But we have not considered the main architectural and archaeological arguments in favor of Dating of the first temples Sloboda the beginning of the XVI century. First of all, consider the architectural and archaeological grounds for Dating 1510 ties to the Church of Metropolitan Alexei. S. pod'yapol'skii, Dating all the monuments of Alexandrov Sloboda XVI century 60-70-ies of the century, faced with the problem: if the Church of Metropolitan Alexei was built at this time, when could be built Crucifixion bell? At the beginning of the 1580's Ivan the terrible left Sloboda, and "krovoisliania grad" was abandoned. New construction it began only in the mid - XVII century, and, of course, refer Crucifixion tower at this time is impossible. In this regard, S. pod'yapol'skii had to say (though in an extremely streamlined and ambiguous form)that "the building up of it (the Church of Metropolitan Alexis - SZ) with strong pylons supporting the steepled bell tower, has the same building characteristics that gave rise VV kavelmaheru for inclusion of other churches Alexandrova Sloboda to one of the construction phase (here is the link to Kavelmahera56 - SZ). From this, it would seem that the transformation of the Church, most likely, was made shortly after its construction57. But this link is correct: the style and construction characteristics are totally different concepts, and no question of the proximity of construction equipment Church of Metropolitan Alexei and Crucifixion bell Kavelmaher not conducted. In this case "one style" could mean even stylistic affinity - Crucifixion bell and architectural forms and base, and innovative features and rails completely different than its predecessor (see Fig. 4, 21-24, 32, 33). Kavelmaher could only be referring to the overall composition of buildings (stolpoobraznost, the bypass galleries major innovative features, the presence of additional belfries), and that in no case can not be reason for convergence dates. 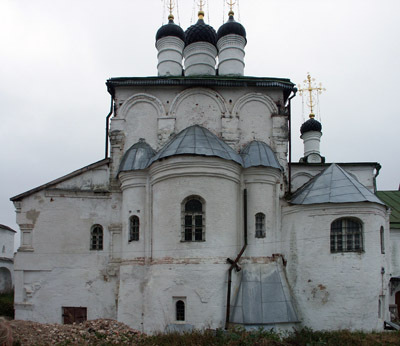 Yet look, could the Church of Metropolitan Alexis to be built and rebuilt within a construction period - 1560-1570-ies. First, we have said above, that masonry and mortar, and style, and execution of the decoration of the Church of Metropolitan Alexei Crucifixion and the bell totally different. В-третьих, обследование автором этой книги второго яруса церкви Алексея митрополита63 revealed: the Windows of this stage was made (and very carefully) is another form prior to the rigging walls of the future Crucifixion bell (see Fig. 29). It is doubtful that in a decade or two after construction would require considerable work to give the Windows a fundamentally new form. Fifth, by probing Astroscope and Kavelmahera inside stair corner Crucifixion bell shows that in places of an adjunction of the walls and pylons Crucifixion bell on detected by probing the fragments of the white-stone basement and obliviscence brick decor of the Church of Metropolitan Alexei there are traces of weathering, which could not manage to appear in the decade or two. From the foregoing it follows that between the construction of the Church of Metropolitan Alexei Crucifixion and the bell went a considerable time, much longer than ten to fifteen years. Thus, these buildings should be attributed to two different construction periods. Move on to the architectural and archaeological arguments put forward by V. kavelmaherom in favor of Dating 1510 ties Trinity Church in the village (unfortunately, these arguments have escaped the attention of most researchers). It is known that after the construction of Trinity Church to its Western facade was added a new section, consisting, as previous%64. Ее следы на чердаке существующей трапезной были обнаружены еще в начале ХХ века епархиальным архитектором Латковым65, о ней писали и А.И.Некрасов66 and Genbachev with Vpolicy67but all these researchers priori believed oneness in time of construction of a Church and the Western extension with a cellar and a basement. - extension belonged to lower the culture of construction (above the entrance to the cellar there is no icon cones, the vaults of the basement have no imposts under strikings, religi - sockets, rough architecture podkletny window, a different form of communication, is wrong and dangerous built separating the basement wall - across seligi cellar vault)68. Об освящении в 1513 году каменного Покровского собора, как мы показывали в п. 2, свидетельствует документальный источник – сообщение «Троицкого летописца». So, we have an independent documentary architectural and archaeological data on the construction in 1510-ies Pokrovsky Cathedral, the Church of the Trinity and the Church of Metropolitan Alexei. Note - the data is independent, i.e. in relation to each of these temples is based on its own system of evidence. Remember that Kavelmaher regardless of these data showed70 (and his point of view was adopted without exception, all researchers, including SS pod'yapol'skii71), which is the Church of the protection, Trinity, Metropolitan Alexei and assumption were built in one construction period (see item 1). Let's not forget and about the arguments related to the proximity of construction equipment of the first temple Alexander the settlement for construction machinery other churches of the era of Basil III (see item 4). Thus, we have not only proved the Dating of the first temples Sloboda 1510 ties, but Dating, proved redundant, very large by the standards of history of ancient architecture. S. pod'yapol'skii wrote that the Dating of monuments Alexander settlement 1510 ties "contrary to established views on the development of architecture of the Moscow Russia of the XVI century"72, "crosses out almost all of the existing views on the development of architectural types and styles of Russian architecture of the XVI century"73. However, an adjustment (or even a complete review), its position in accordance with the new architectural and archaeological and documentary evidence must be ready to every historian of architecture. 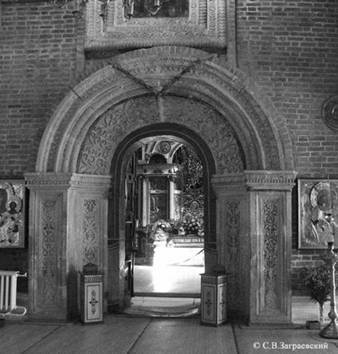 So it was in the 1930-ies, when PN Maksimov found under the riggings the ancient Cathedral of the Andronikov monastery74it was in the 1950-ies, when excavations Voronin opened the white-stone walls Bogolyubov75 and the gallery of the Church of the Intercession on the Nerl76it was in the 1960-ies, when BP dedushenko established the membership of the existing Cathedral High-Petrovsky monastery creativity Aleviz New77 it was in the 1980-ies, when Kavelmaher and T. Panova found on Sobornaya square of the Kremlin, octagon bell tower of St John Climacus78it was in the 1990-ies, when excavations M. ioannisyan opened in Rostov rubble Church of Boris and Gleb, 128779it was in the early 2000's, when studies showed traces the transformation of the vaults of the Dormition Cathedral in Vladimir and confirmed the hypothesis that the initial five-domed temple80. What will historians of architecture to adjust and revise now, when it finally became clear to the correctness of the Dating Kavelmahera in respect of monuments Alexander settlement? Here are just some of the components (especially those that are mentioned in the works of al Batalov and S. Podyapolsky). "Construction of the Cathedral with two adjoining when the81. Теперь мы знаем уже два храма начала XVI века, имевших такую композицию, – Спасский в Кремле и Покровский в Слободе82. "Panels with characteristic angular wedges still completely unknown at the buildings of the beginning of the XVI century"83). Now, these panels are known to us - Alexandrov Sloboda. "Simplification of the classic profiles (for example, lack raskrepovki cornice above the pilasters) took place in 1570-s"84. Now, we notice this "simplification" (albeit relative) and in the temples Sloboda beginning of XVI century, with which we made in paragraph 3 of this Chapter the caveat that small and not widespread rastrapovich cornices still took place. 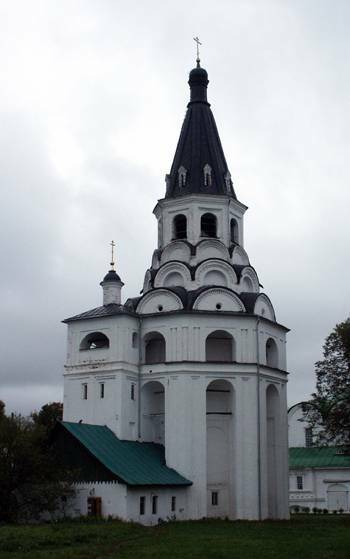 "For the beginning of XVI century the most characteristic arched porch with a blank wall in the lower tier and with open arches at the top, and as for the porch with open arcades in the lower tier and support the roof of the stone pillars at the top, we know of only one such case, namely the Church of the ascension in Kolomenskoye"85. 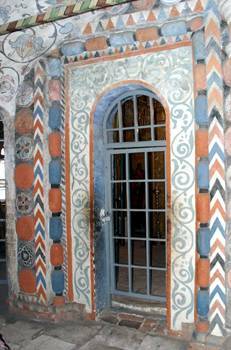 Now in the beginning of XVI century, we know of such porch and in the Pokrovsky Cathedral of the Alexander settlement. "Acceptance of partition panels of surfaces octagonal first used in the Cathedral of the Intercession on the Moat"86 - now we see that this technique was first used in the temples Settlement 1510-ies. «Троицкая церковь соответствует типу шатрового храма, сложившемуся в середине и второй половине столетия»88. Now we must say that this type of Church is close to the traditional, with three apses, with rectangular is completed horizontal thrust, with innovative features, moved to the verge of the octagon, - was formed in the beginning of the century. 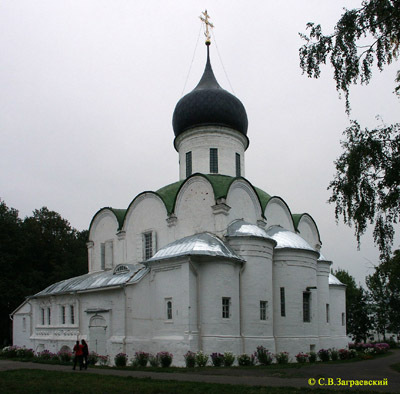 And, of course, the main subject to review the situation currently prevailing theory is that the first marquee Church was the Church of the ascension in Kolomenskoye (1529-1532 years). The first marquee Church in Russia was Trinity Church in Alexandrov Sloboda, built in 1510-ies. In addition to the foregoing VV kavelmaherom note that later date the Church of the ascension in comparison with the Trinity Church in no way detracts from the value of Kolomna monument to Russian architecture. In this Church, along with a tent wall pylons were used, which allowed to construct a large building of unprecedented proportions, with "flying" architectonics. Trinity Church of the ascension in comparison with "touch down" and, as repeatedly demonstrated and Kavelmaher90 very imperfect in engineering terms. And this is an additional argument in favor of Dating the Church in the village 1510 ties, as Ivan IV, who gave a stone Church building special attention, who built such masterpieces as the Cathedral of the intercession on the Moat, the Church of the beheading of John the Baptist in Djakova, and many others, could not be erected in the main residence, Alexandrovskaya Sloboda - "ugly and regressive" Palace temple. Note that the Dating of the first temples Sloboda 10-ies of the XVI century gives special urgency A.I. Nekrasov said: "Monuments of Alexandrova Sloboda - not any provincial structures (as we would be forced to put in case of acceptance of them Dating to the second half of the century - SZ), and are at the forefront of the capital's architectural and artistic and ideological"91.